Don’t be scared of quinoa if you’ve never had it. 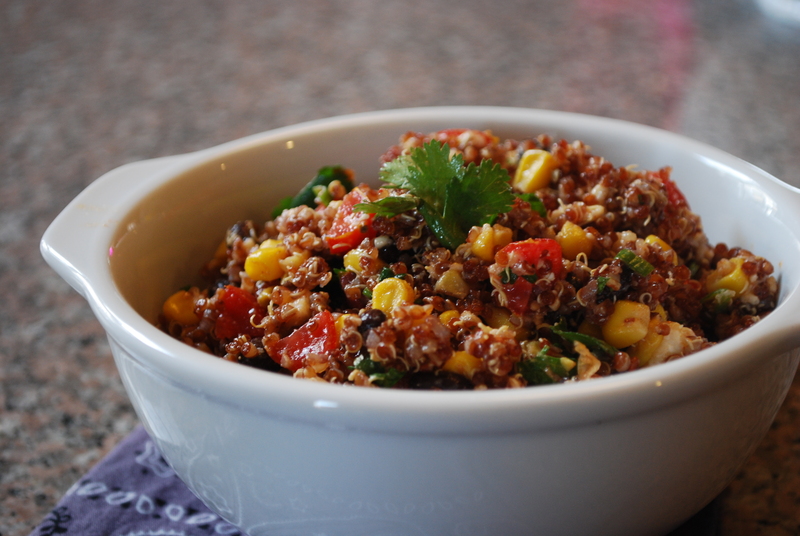 Quinoa is very healthy for you and has lots of fiber and protein, and it’s actually very tasty. There are a couple of varieties: red and white. I personally prefer the red just because it visually looks more appealing and looks more gourmet. The red quinoa is harder to find and is generally more expensive than the white, but use what you like. This salad is very flavorful and makes for an excellent side dish. It’s also great for a picnic or potluck because it doesn’t need to be kept cold. Recipe adapted from Jeanette’s Healthy Living. Rinse and drain quinoa thoroughly in cold water before cooking. Place quinoa and water in a saucepan and bring to a boil. Reduce to a simmer, cover and cook until all water is absorbed, about 15 minutes. Fluff with a fork. Meanwhile, heat olive oil in a large skillet. Saute corn and garlic until corn has some brown spots (that’s the caramelization that makes the corn even sweeter). Transfer to a large bowl and toss in the quinoa and the rest of the ingredients. Season to your liking with additional chili powder, cayenne pepper, salt and pepper.